I feel like I am always dreaming of candy. You’d think I eat candy every day, but I don’t. I only get it every once and a while. After the recent U.S. election I went FOUR WHOLE days without any sweets. I probably should have eaten some given the state of this country and my sad state of mind. * It is a very rare occasion that I have a candy bar, but when I do I want it to be a real treat. If I am going to throw away all of those calories and fat, I should indulge. Go Max Go has candy bars that make me want to indulge. 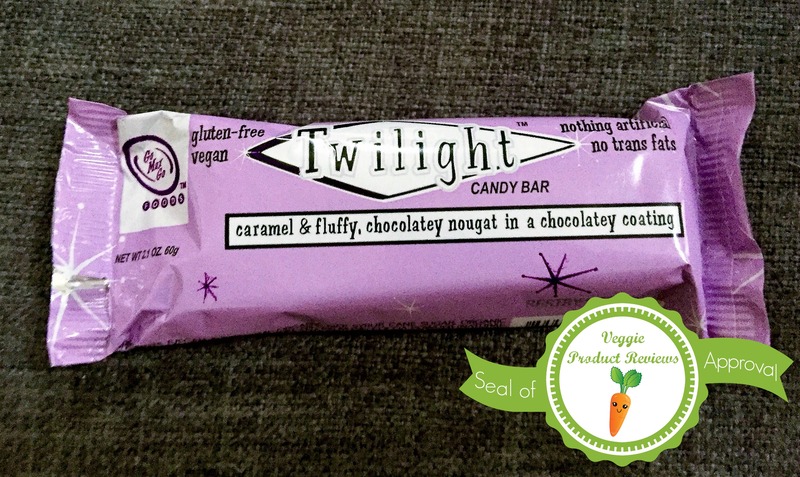 The one I am highlighting today is the Twilight bar. It is an imitation of a candy bar that has a whipped chocolate center and rich caramel all covered in a milk chocolate. Go Max Go uses rice milk chocolate. It is better than what I remember of milk chocolate. The chocolate covering this candy bar tastes better than what I remember of milk chocolate. This candy bar imitates the childhood candy bar that I remember perfectly. This is a vegan candy bar. This should count for several pros. It is gluten free and now has a GF symbol. There are no hydrogenated oils/trans fat like diary candy bars. I wish this product were available at all stores! I’ve only been able to find it at Whole Foods and online. As with most vegan products, the price is a bit high. I think the average price is about $2.50 a bar. This isn’t bad for a treat, but is pricey if you want candy bars on a regular basis. *This political viewpoint is from Amanda and is not necessarily the viewpoint of all reviewers on this blog. Great review, I completely agree – especially with the cons. Why so expensive and hard to track down?! As another pro, I also really like the name. And the colour of the packaging. All these important things! Those are really great additional pros! I think Go Max Go does a great job with naming the candy bars. And who doesn’t love a lavender package!!! I love my candy too 🙂 and I’m all about treating yourself. There’s a vegan fish and chip shop near me that does deep fried twilight bars! Amazing.